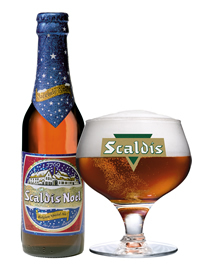 Scaldis Noël aka Bush De Noël brewed by Brasserie Dubuisson Frères sprl. 8.48 oz bottle poured into a New Belgium glass. 12% abv. Purchased at Whole Foods Market Arroyo in Pasadena, CA. Appearance: Cloudy dark tan body with a 1/4 inch dense ring around the top. Aroma: Vanilla, caramel, apple, and alcohol. Taste: Vanilla, booze, spicy hops, tart apple, and green pear. Mouthfeel: Warm, spicy, and sticky. Overall: I am happy with the packaging, I’m impressed with the warms and flavors. In snooping around on Google, I have found this beer is, in my opinion, underrated. Known as Scaldis rather than Bush, so that dumb people don’t have market confusion with Anheuser Busch and the oh-so-tasty, and ever delicious Busch Beer. Anderson Valley Winter Solstice Full Sail Wassail – A Christmas Miracle!